Staff and patients at Texas Children's Hospital celebrated their therapy dog's birthday. HOUSTON (KTRK) -- Texas Children's Hospital's therapy dog "Elsa" celebrated her 2nd birthday on Thursday with patients and friends alike. The four-legged, full-time employee arrived at the hospital in October 2016 and has brought smiles and comfort to patients, families, visitors and employees ever since. To commemorate her special day, Elsa donned a colorful tutu, party hat, and a birthday bandana. She spent time greeting patients and guests, playing with her new toys and enjoyed a dog-friendly birthday cake from Three Brothers Bakery. Patients also wrote birthday cards for Elsa and decorated cookies to enjoy. 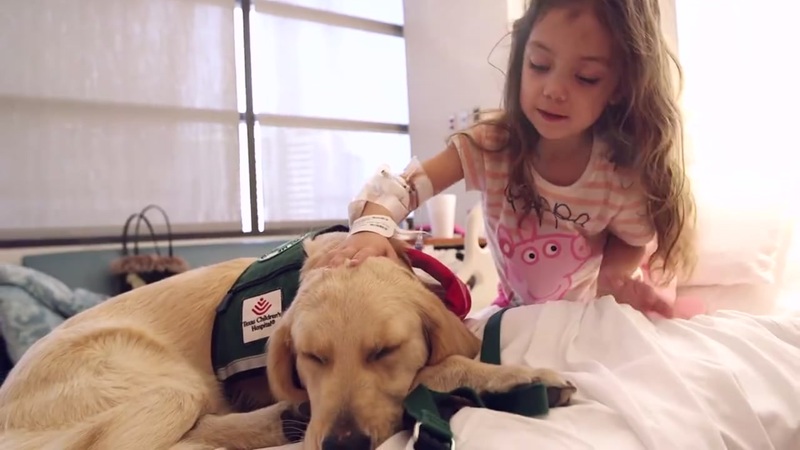 Graciously funded by a donor family, the golden retriever spends her days with her handler and Texas Children's child life specialist, Sarah Herbek. The two collaborate with medical teams and physical and occupational therapists to provide support to patients who may be having trouble coping with hospital stays, a new diagnosis or other experiences. The congenial canine traveled from room to room, delivering one-on-one cuddling sessions and Valentine's cards to patients.